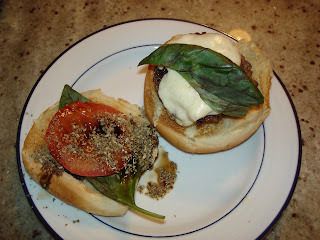 Tonight's burger recipe was one of my four-star burger classics - a very simple, easy to prepare Italian burger, which I refer to as "From Rome With Love." Like my other burgers, this one should be prepared with high quality ground beef. You will need about 1.25 lbs, which should be enough about four burgers. My conception of the burger, is that it should be inspired by a particular city or location. I have already shared by California Burger, inspired by the flavors of Napa Valley. In addition, I have shared my "Back to College" Burger ,which for me is the Philadelphia Burger. That burger recipe was inspired by my days of eating Philly cheesesteaks as an undergrad at Haverford College. Today, I present a burger inspired by the most basic of Italian cusine - tomato, basil, mozzarella. I travelled to Italy in the summer of 2000 (and hope to go again in the next couple years) and one of my best memories was the incredible Italian cuisine, including quite a bit of homemade Italian mozzarella, often accompanied by basil, balsamic and fresh roma tomatoes. Here, I have attempted to put just a tiny bit of Italy in my burger tonight. To prepare the burger, use a grill pan, and grill as long as you desire, depending on your personal preference. My husband and I like our burgers medium-well, so we grill for a total of about 8 minutes. For the last minute or so oif the grilling, top with a healthy-size chunk of fresh mozzarella and cover with a piece of tin foil . You can prepare all four burgers at the same time on your grill pan. When you are done, put on a toasted bun, and add the basil leaves, a teaspoon of balsamic vinegar, as well as a pinch of oregano. Served to you from Rome with love. For another writer's take on the burger, click here for Cindy's burger.